Last month I ran into Ecuador’s popular president Rafael Correa as he was campaigning for a third term—he has since been re-elected with a record majority—and recalled his path-breaking decision to issue compulsory licences (CLs) to ensure cheaper medicines for his expanding public health programme. The decree, the first such in Latin America, was issued in October 2009 for some much-needed drugs and, six months later, the Ecuadorian government handed out the first CL on US multinational Abbott’s ritonavir, an AIDS medication. That incidentally was given to India’s Cipla. Correa was pleased—and surprised—when I reminded him of this at Quito airport a few weeks ago. Compulsory licensing allows governments to override patents, with or without the consent of the patent-holder, and ask other companies to make and sell a generic version of a patented drug, usually at a fraction of its original cost. 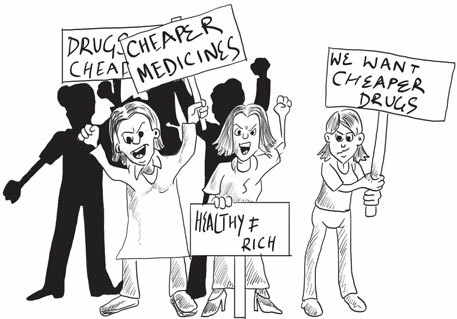 But to take on pharmaceutical multinationals is a tough proposition. Big Pharma, backed by governments, uses a variety of pressure tactics to stop the use of CLs, although this is a flexibility permitted under the tight intellectual property rules, or TRIPS as they are known, of the World Trade Organisation. Just look at what happened in South Africa, Thailand and some other countries when they tried the CL route to produce cheaper- priced generic versions of patented drugs. Developing country governments need to be made of sterner stuff to withstand the pressures. Correa, with his penchant for confronting the US, was not one to back down. Unlike Ecuador, India doesn’t require a presidential decree to issue CLs. Its TRIPS-compliant Patent (Amendment) Act of 2005 allows it to issue CLs under Sections 84 and 92. But it has been treading warily on CLs despite an official report of the Department of Industrial Policy and Promotion (DIPP), which handles intellectual property issues, recommending their use. The country’s first CL was issued in March 2012, but that was on the application of a private company, Natco Pharma of Hyderabad for a liver and kidney treatment drug, and was not a government initiative. But reports have been rife in recent weeks that Delhi is willing to take the plunge now. Newspapers have reported that the Department of Pharmaceuticals has started the process of issuing CL for three major cancer drugs, trastuzumab (sold as Herceptin by Roche) that is used to treat breast cancer, ixabepilone (used for chemotherapy) and dasatinib for treating leukaemia, the latter two being brands of Bristol Myers Squibb. The reported move comes in the wake of a campaign launched by cancer survivors and civil society groups demanding cheaper medication to treat, in particular, breast cancer which afflicts around 100,000 women in India every year. Kalyani Menon-Sen, who coordinates the campaign, wrote to the prime minister in November last year explaining why it was vital to bring down prices of trastuzumab drastically. One in 22 Indian women is likely to get breast cancer during her lifetime and one succumbs to breast cancer every 10 minutes. “Breast cancer is now the most common form of cancer in urban areas and the second most common cancer in rural areas,” says the petition which points to a more worrying trend: younger women are becoming more susceptible to breast cancer, with almost 50 per cent of patients being women under 50. They are also reporting increased incidence of HER2+, a particularly aggressive form of breast cancer which is difficult to treat. Against this backdrop, the price of Roche’s Herceptin appears obscenely predatory. It now costs around $1,964 a vial, down from the original $2,000 (Rs 1.10 lakh) after Roche cut its price in the wake of the first CL issued to Natco for sorafenib tosylate. In sum, it would cost patients around Rs 14 lakh for the full treatment. Roche has licensed the drug to domestic generics manufacturer Emcure Pharma which, since August 2012, is offering a repacked version of trastuzumab at $1,310 per dose. The telling figures are costs of sorafenib, which is used to treat liver and kidney cancers: Natco’s generic version sells for just Rs 8,800 for a month’s treatment compared with Rs 2.80 lakh charged by patent owner Bayer for its Nexavar brand. Herceptin prices are unlikely to see that kind of price reduction in the near future. Trastuzumab is based on recombinant DNA technology and belongs to a class of biologics called monoclonal antibodies. This group, as its name implies, is derived from a single cell-line which is then cloned to produce a large number of cells and genetically engineered to produce the required antibodies. According to industry sources, in the case of Herceptin, domestic generics firms are still a long way off from commercialising biosimilars or the generic version of this complex drug. With a secondary patent on Herceptin in India set to expire only in 2019, Roche could continue to enjoy its monopoly, CL or no CL. As per ancient scriptures, any ailment is the making of the individual and the cure lies within the body of the individual. Based on this several therapies are available like acupressure, acupuncture, Yoga etc., In addition a therapy administered in 1977 with ingredients from my body fluids cured me of allergic rhinitis. The medical practitioner informed that the same therapy has cured a number of people from asthma. I feel after studying some articles on genetics, epigenetics that the the therapy is similar to stem cell therapy. The therapy needs a detailed study by concerned specialists.